I am super lucky to live less than 10 miles from my mom, younger sisters and my sister-in-law. We often do family dinners or a movie night or BBQ. Family gatherings are a frequent occurrence. However, we never took advantage of the situation and did Girl’s Nights very often, if ever. With another testosterone-dominate baby about to take over our house, I decided that needed to change. My days may be filled with trains, trucks, Legos and racecars; but, I still have glitter and bows in my veins. 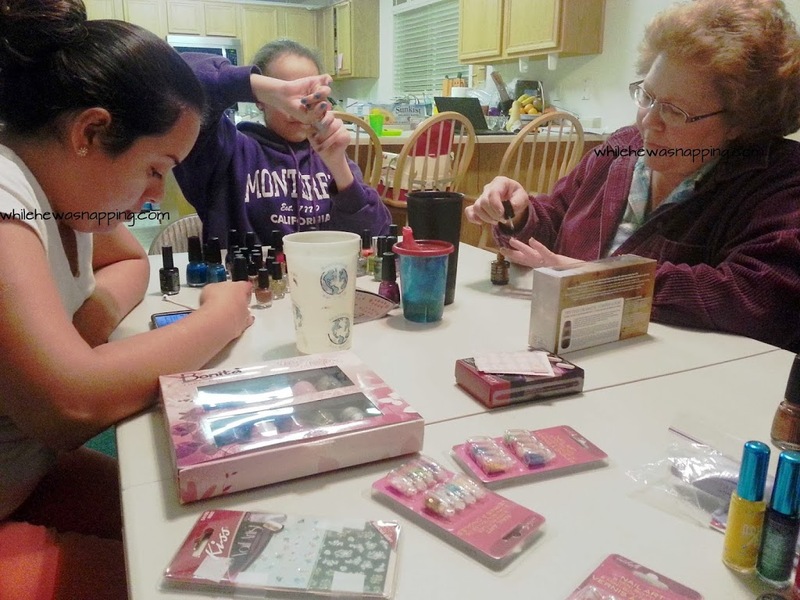 So, for Christmas, I gave my mom and sisters a Girl’s Night Club Kit. 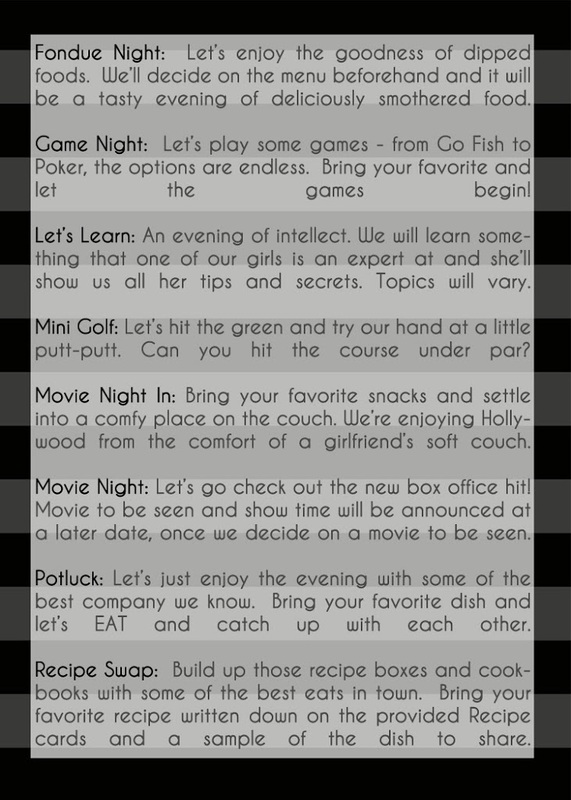 Here’s the quick basics on that: It was a handmade gift basket that explained we’d be having Girl’s Night once a month. I kept it pretty lax and we are planning our activities as the months come. I started out with this huge, grande gift idea of pre-planned activities and an elaborate gift basket, but I just kept paring it down as I ran out of time and Christmas got closer. 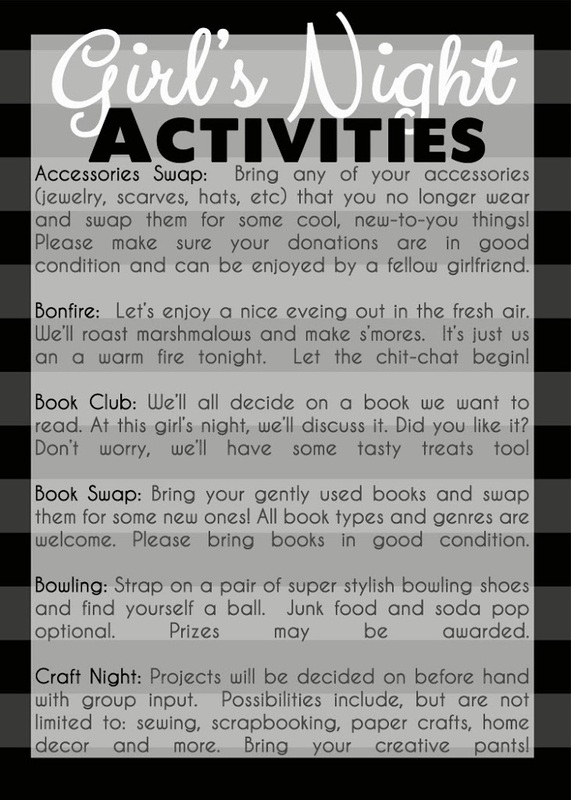 I have the activity ideas planned and we manage the details as the event gets closer. The activities included things like movie night in (we have a projector we put on the wall and it makes for a movie theater at home), movie night out, fondue, spa night, craft night, mini golf, bowling, recipe swap, book swap, accessories swap, bonfire & s’mores, jewelry crafting and the like. Activities that are fairly inexpensive (or free) and something we all have the skill level to do – my youngest sister is 13. The gift baskets held the following items: homemade salt scrub, lotion and chapstick for spa night, fun socks for bowling night, a chalkboard countdown board for craft night, faux movie tickets for movie night in, baggie of microwave popcorn and a box of movie theater candy for movie night out, chocolate dipped marshmallows for fondue night, recipe cards for recipe swap night, handmade knit ear warmer for accessory swap night, and a graham cracker with chocolate squares and marshmallow for bonfire night. Simple and pretty inexpensive. Unfortunately, I didn’t get photos before they were gifted. Whoops. Ok, so that was the basic background info. We had our first Girl’s Night the middle of January. 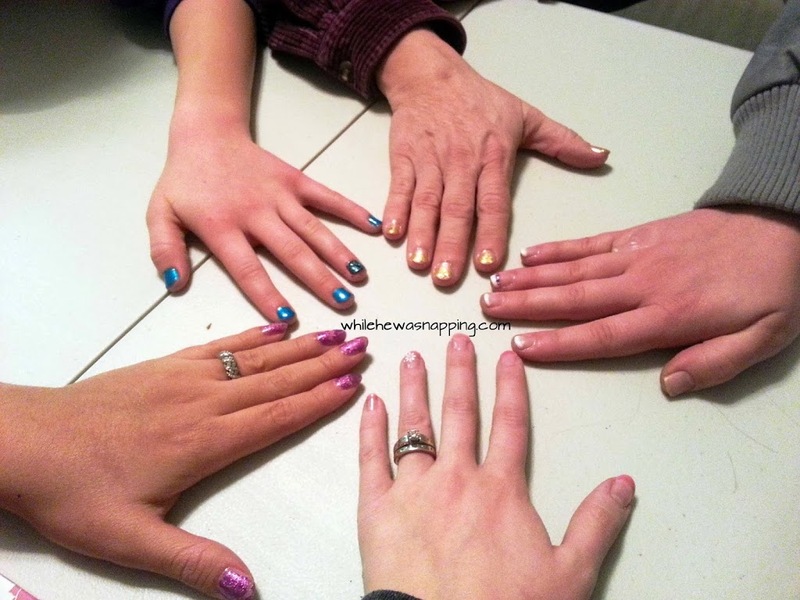 We did a mani/pedi night. 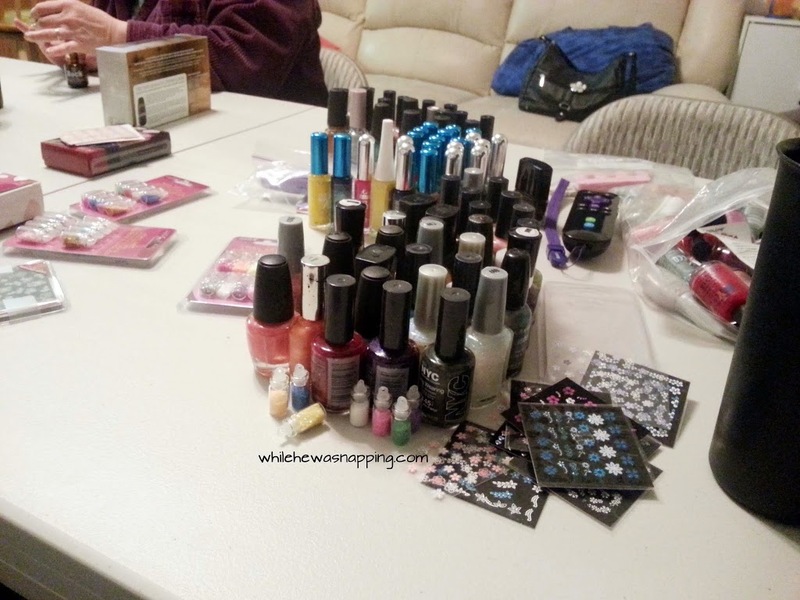 Everyone brought their collection of nail goodies and we painted nails. Yep, just like a bunch of 14 year-olds at a sleepover. It was awesome. We got to chat over Subway sandwiches for dinner (thanks, Momma!) and then we pulled out all the fun nail colors and accessories. Yup, we even have a FB Group – since everyone has Facebook and it’s easy to stay updated on there. One of my sisters has been getting into the DIY gel nail polish (I’ve never had a real manicure at a salon or anything before) and she gave me a mani with them (the perks to being pregnant… no one really says no when you ask them to do things for you… just sayin’). I think I’m sold on the idea – the cost of it might take more time to convince me though. Traditional nail polish on my fingernails typically chips in a day or two. I had this on for over a week and it still looked brand-new. Awesome. But the best thing was the time we got to spend time together, being girls! 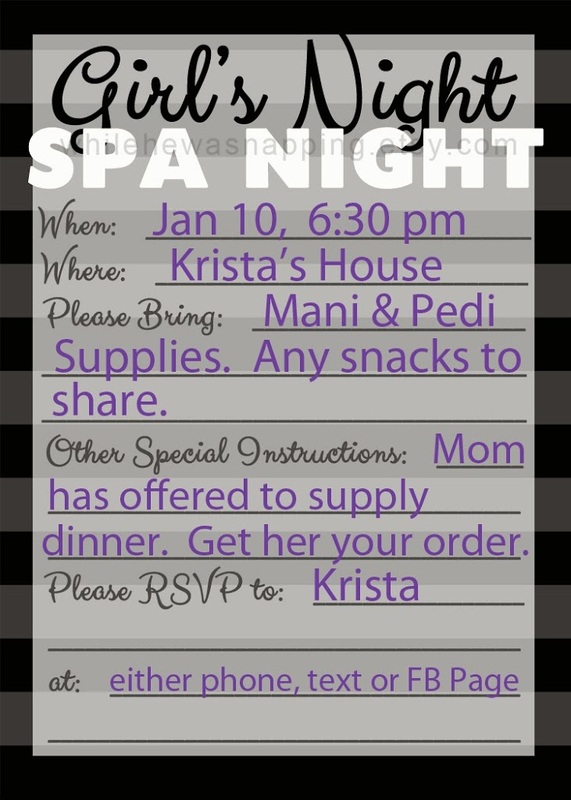 Simple, fun and super great for building those relationships… besides, who couldn’t use a little pampering?